The Mid-Lake Pavilion Teahouse, which is also the most traditional teahouse in Shanghai, gained fame after Britain's Queen Elizabeth II visited it in 1986. A master bakes tea leaves at the Mid-Lake Pavilion Teahouse in the Yuyuan Garden Malls at the weekend. A tea culture festival was launched at the Yuyuan Garden Malls over the weekend showcasing, among other activities, the city’s oldest teahouse built some two centuries ago. 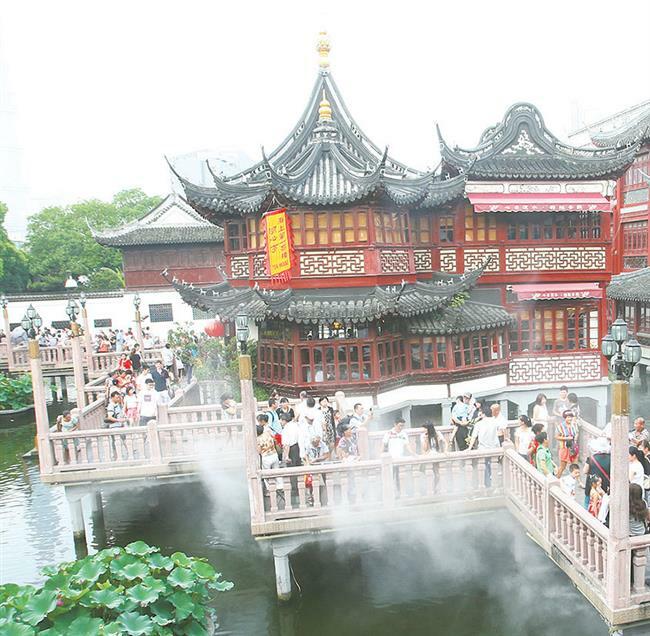 The Mid-Lake Pavilion Teahouse, which is also the most traditional teahouse in Shanghai, has gained fame after receiving many foreign dignitaries, including Britain’s Queen Elizabeth II as well as presidents and politicians from more than 20 countries. The opening ceremony for the monthlong festival was held in the central plaza of the malls on Saturday. Local youths showcased an ink painting they created at the pavilion and recited a landmark inscription about the history of the structure. The inscription on the stone tablet, a national-level cultural relic which still stands within the pavilion today, was written by Lu Xixiong, a judicial official in the Qing Dynasty (1644-1911), shortly after it was built in 1784 as a place for businessmen to gather. In it, Lu praised the scenery of the pavilion and noted the site had already become a city landmark for tourists and businessmen by then. To better protect the historic heritage, Yuyuan Inc and a local printing museum jointly copied the inscriptions on the tablet with laser scanning and printing technology. During the festival, which will run through the end of the month, tea-related performances will be held every week at the central plaza of the malls. Visitors can also experience the baking process of tea and learn to recognize various teas and specialized wares. 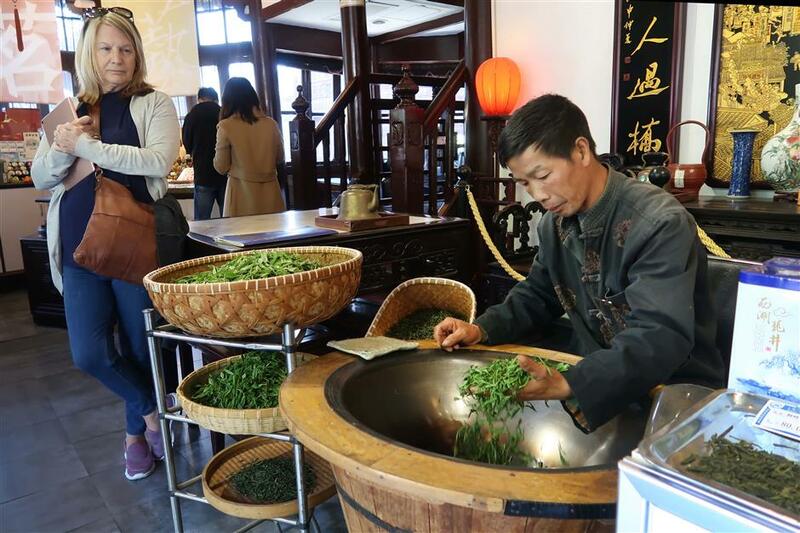 “The event is aimed at helping residents better understand the traditional tea culture and contribute to its heritage,” according to Yuyuan Inc, the owner of the commercial properties at the Yuyuan Garden Malls. The mall is willing to cooperate with local schools to serve as a cultural education center for the young generation, it said. The Mid-Lake Pavilion Teahouse at Yuyuan Garden Malls. In ancient China, people of different classes and careers gathered at teahouses to meet friends and share the latest news. As an important port, Shanghai enjoyed a headstart in the teahouse culture. It is said a businessman purchased the Mid-Lake Pavilion and converted it into the city’s first teahouse in 1855. He later lost the teahouse to another businessman due to gambling and this tycoon repaired the building carefully and made it a popular gathering place for local scholars and calligraphers. The teahouse still retains its original style of decoration, such as wooden folding screen and horizontal inscribed board. It sits in the center of the lake at the Yuyuan Garden Malls and provides a great view for customers together with good tea and fine snacks. Typical of the architecture during the Ming and Qing dynasties, the teahouse is a two-story wooden pavilion covering 200 square meters and is decorated with complex carvings on pillars and divine animal statues on the roof. A wide range of well-known teas are provided, including West Lake Longjing tea, Dongting Biluochun, Qimen black tea and Anxi Tieguanyin tea. Special delicacies such as quail eggs boiled together with Tieguanyin tea are served to complement the tea. The teahouse pavilion shot to fame when it welcomed Queen Elizabeth II in 1986. She sat on a rosewood round table near the east window and praised the beautiful scenery seen from there. The British queen also tasted a pot of Longjing tea while enjoying the traditional string and pipe music of China’s Jiangnan area (regions south of the Yangtze River). It then became a popular reception site for foreign politicians and celebrities. The mall recommends that visitors enter the historic teahouse through the Zigzag Bridge during the festival to watch the tablet, enjoy the scenery and taste the traditional teas.